Nothing beats the comfort of ending your long and tiring day nestled in your bed between a nice blanket and an inviting bed sheet. Today, people who want to make their sleep better and wake up the next morning feeling refreshed and rejuvenated can look for the best Jaipur bed sheets that are now available for everyone. Back in the early days, bed sheets were never seen as thing of beauty as they are today. These covers used to be a simple square of flannel with a plain color. They were not washed and instead, they are just aired out or placed on the clothesline occasionally. In the early times, only the wealthy people were given the chance to sleep on bed sheets made from woven and elegant fabrics. But thanks to the advent of technology and with more and more man made fabrics being introduced, bed sheets have become a staple decoration for rooms and no longer seen as a cover that serves a single purpose. With their bright colors, exquisite patterns and amazing materials,bed sheets are now a great addition to every bedroom. Bed sheets of the modern era come in various styles. Now,you can find printed bed sheet, hand made bed sheet, block print bed sheet and other designs that you can choose from. Whatever your preferences might be, the wide range of online quality bed sheets guarantees you that you can find the one that will suit your taste and style. A richly patterned and printed bed sheet can be your perfect option if you want to add some design to your simple room decor. Most printed sheets boasts of a captivating array of patterns and prints that will definitely get your eyes glued to your bed for a long time. Hand made bed sheet is also a favorite of many people today simply because of the intricacy of their designs and the strict attention to details put into each piece by the maker. If you really want to sleep in style,these hand made bed sheets are exactly what you need. The block print bed sheet from India is also among the most in demand types of bed sheets that you can find today. These too reflect amazing artistry and an excellent craftsmanship that reflect the rich culture of the place where it has been made. Block print bed sheets also go well with different bedroom decors and designs so you can be sure that they will fit imperfectly. Today, you can find online quality bed sheets that come in affordable prices like those offered in Jaipur Fabric. As the leading provider of Indian bed sheets, the company offers an extensive range of Jaipur bed sheets that can instantly turn your room into a wonderland on its own. 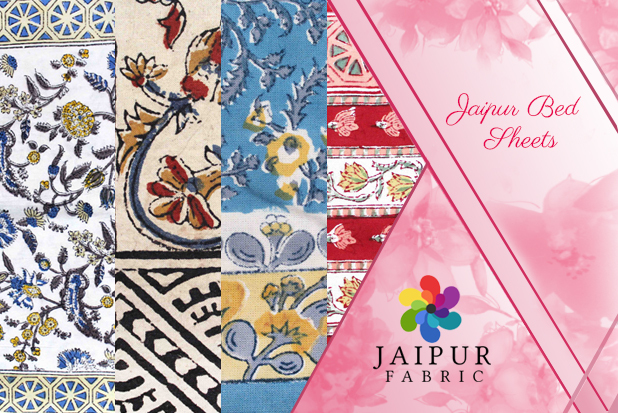 Jaipur Fabric believes that everyone deserves to sleep on a bed covered with luxurious bed sheet and their collection of Jaipur bed sheets are certified must-have.